What does the Northern Ireland Curriculum state about gymnastics? Physical Education in the curriculum provides the opportunity for specific attention to be given to the physical development, health and well-being of children. The purpose of this resource is to provide teachers and assistants with support in planning, teaching and assessing Physical Development in the Foundation Stage. 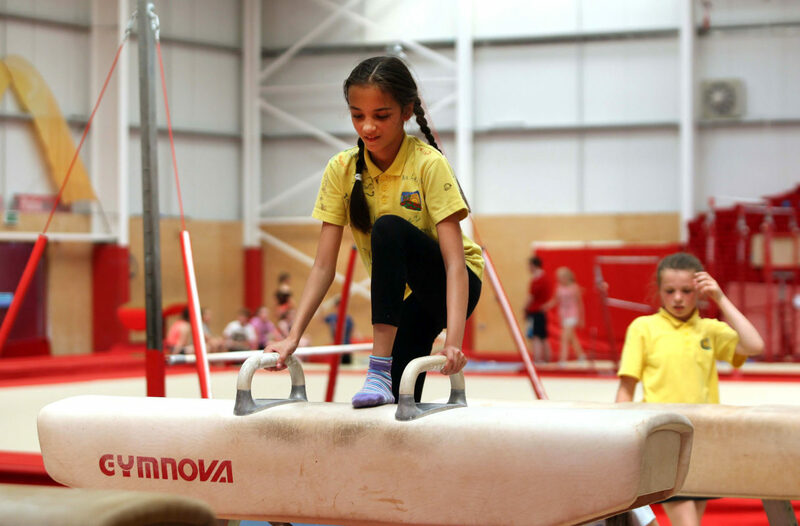 Salto’s school programme offers a great introduction to the core skills of gymnastics covering all key stages from pre-school through to secondary education. The pupils work on a broad range of skills including coordination, strength and flexibility. All classes are fully structured and led by our British Gymnastics qualified coaches. Each session is one full hour consisting of general warm-up, followed by small group activities on all apparatus. On your visit to us the pupils will use a combination of apparatus, floor, A bars, beam, vault, parallel bars, pommel, rings, circuit, trampoline. Minimum cost of £60 per one hour class, based on 20 children. Any more than 20 children – £3.00 per child. The gym can take a max of 30 children. Our coaches are qualified to coach pre-schools, nurseries, primary schools and secondary schools.